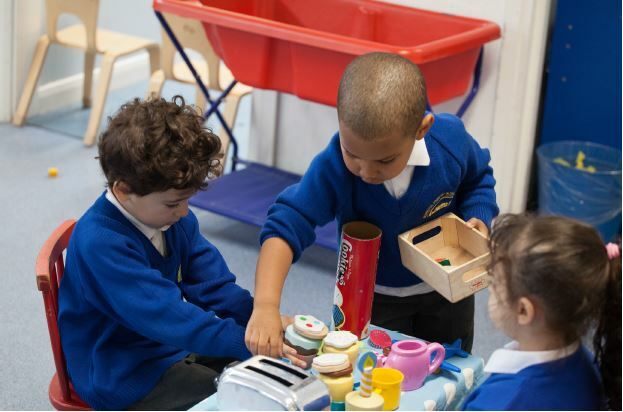 Our Early Years setting is an exciting and nurturing place where children learn through play and creativity. The three classes in our setting lead out onto our large, newly redeveloped outdoor learning area which children can freely access throughout the day. 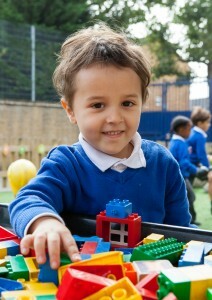 Early Years at Bevington is a nurturing and vibrant place where children feel safe and secure. Children leave Reception as well-rounded individuals with the essential skills that will stand them in good stead for their educational journey. The free-flow nature of our EYFS unit enables both Nursery and Reception children to play and learn together. We understand that children develop at their own rates and ensure that all focus work is tailored to children’s varying abilities. We encourage children to be independent and our indoor and outdoor environments enable children to select their own resources to further their learning. Through stimulating topics children are able to make rapid progress across the seven ‘Areas of Learning and Development’. In addition to our topics, we take into account children’s individual interests and base weekly activities on what the children have chosen. A typical day in our setting generally consists of topic, phonics and maths carpet sessions, as well as one-to-one focus work with an adult, and most importantly lots and lots of child initiated learning through play. Music, dance and drama form a crucial part of our curriculum and across the year, children learn a range of traditional and contemporary songs to sing and they receive lessons in physical education. As well as teaching children to be kind and gentle to one another, we also help them to show care and concern for living things and the environment. Each spring, we receive live eggs and children have the chance to watch them hatch into chicks and look after them before they return to the farm. Assessments in Early Years are based on what practitioners observe and what they know about the children through interactions and co-playing. Parental engagement is fundamental to children’s development and we regularly encourage parents to join us for ‘Stay & Play’ sessions and to accompany us on trips. Parent and carer workshops are held to provide parents with an understanding of how they can support their child at home. In addition, parents are encouraged to bring in work and pictures from home, to contribute to children’s Learning Diaries. Early Years education is the foundation to a child’s love of learning and at Bevington we ensure that we provide the enriching educational experience every child deserves.